While the influence of the Schindler House continues to grow within the broader culture, contributing to contemporary ideas about design in Southern California and beyond, its history may be unknown to the newly acquainted. Our work attempts to resist a reverential position towards the celebrated aspects of R.M. Schindler’s seminal work, and instead investigates the evidence of narratives embedded within the structure’s drama and decay—impressions left by those who lived within its walls and by natural forces. Among the initial documents received in our Schindler Lab brief, a section entitled “Handling and Care of the Schindler House and Property” suggests the fragility of this historic structure. These restrictions opened an opportunity to further explore not only the house-as-artifact, but also the tension between the historic structure and its visitors—a population which grows proportionally to the appreciation of the subject while inadvertently contributing to its decay. Conscious of this dynamic, we hope to expose more inconspicuous elements of the house without accelerating deterioration. The sense for the perception of architecture is not the eyes—but living. Our life is its image. Impressions seeks to create a multisensory pedagogical experience by materially casting the marks of physical trauma sustained by the house, resulting from owner modifications, structural weaknesses, and natural phenomena. These impression-casts provide an alternative reading to Schindler’s pronouncement that life is the image of architecture. We explore the lives that inhabited the house. As architecture imparts impressions to its users, its users also leave their impressions on the architecture. Abandoned light socket (not original). 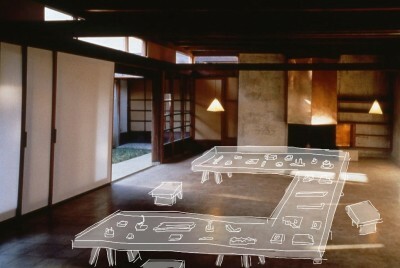 Ghost of kitchen Schindler designed for Dione Neutra. Drain on floor, rust stain and other discoloration on wall, discolored rectangle on floor. Removed mid-1940s. No known photographs. Electric conduit leading to a music system. The turntable was in a built-in cabinet in the Chace entry. Water lines presumably fed the washing machine. First hole on the left is a drain. Middle holes mounted a wash tub (see rectangle with round corners). A miscalculation during construction. Boards were cast into the slab to mount the vertical supporting walls. This one is in the wrong location. Electrical conduit to sleeping basket and music system (see no. 3). Gas pipe leading to wall heater installed at right end of fireplace in CBC. Electrical conduit to non-original light. The exhibit tables are located in various rooms and allow the impression-casts to be distributed throughout the house, locating them proximate to their respective origins. The floor plan demonstrates a distribution of the pieces and locates the areas from where the selection of sample casts were taken. The collective movement and overlapping activities of visitors will foster social encounters both haptic and contemplative. Nuances of the exhibit’s execution will embolden the visitor to touch and explore, while fostering an appreciation for the care of the house. Responding to Schindler’s emphasis on low, horizontal furniture, the casts are exhibited on low tables of unsealed plywood that relate to the atmosphere of an archeological dig. The table’s edges are upturned and provide a tray-like perimeter for the containment of the impression-cast pieces, while a removable lid converts the chair into a kind of specimen tray. Minimal notation labels accompany the table and chairs to identify the location of each idiosyncratic casting. Accompanying the action-oriented experience of handling and moving the impression-casts, a range of information both direct and oblique will be provided to enrich the experience. Each impression-cast will be tagged with an ID number and a QR code, enabling access to different types of content. Taking cues from the exhibit furniture, viewers are encouraged to improvise their exploration of the impression-casts and the house itself. The installation is complete, only with the interaction of the visitor, through browsing, handling, and accompanying the impression-casts to their points of origin. *Note: This proposal is being considered for future development. John K. Chan is a Los Angeles-based architect. Nery Gabriel Lemus is a Los Angeles-based artist.